Several years ago, my yoga practice relied upon a few audio podcasts. A few times a week, I’d roll out my mat, maybe light a candle, queue up the podcast on my iPod, then follow the instructions for 30 or 60 minutes. In some of the more stationary instruction narratives, I was instructed to hold my hands a certain way: usually laying one palm in the other, or bringing my hands to a prayer-like arrangement in front of my chest. The term “mudra” was usually at the end of the sanskrit name for these hand-poses. Ahnjelly mudra. Bye-rahvuhmudra. Chinmudra. I figured the action of arranging your fingers in a certain way was, at the very least, important as it gave you something specific to do with your hands. Otherwise, they might fidget, right? That alone was good enough reason to keep doing it. But, I remained curious, if mainly by the etymology. So, over the course of 2016 I did some research. 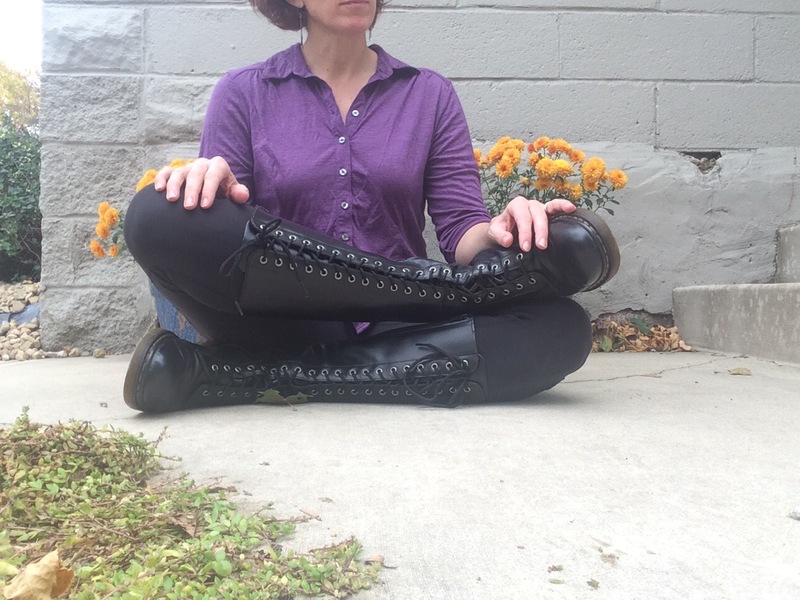 I took a mudras workshop, read a few of the books referenced in the workshop, and then worked a mudra or two into my daily meditation practice. For the last month or so, I have not been using any specific mudra in my meditation, mostly as I’ve been using a personal mantra and that’s more than enough to focus on for 15- 30 minutes, once or twice a day. I’m feeling like my original take on the significance of a mudra – see above – pretty much sums it up. However, here are a few things I learned, which I’d like to share. In the future I hope to look into them all in more depth. Mudra means: a specific arrangement of the fingers and hands, to be held still. “Yoga for the hands” is true in a deeper sense: it’s less a movement exercise, and more of a very intentional choice about how you arrange your hands. Some mudras are quite complex, even arranging the fingers of one hand differently from how the other hand’s fingers are arranged. And yet, some mudras are so simple that my hands easily fall into them, naturally. For example: Bhairava mudra. I think the mudra that piqued my interest most, at the beginning of this adventure was Bhairava mudra. The right hand rests, palm facing up, in the left hand’s palm, and you lay this arrangement in your lap. The ease of it was what intrigued me – I wondered what “bye-rahvuh” meant. And so, a few years later when I took a yoga studies class, I gained some insight by learning a little about the cast of characters, and some common themes in Hindu mythology. Bhairava is one of the manifestations of Shiva — in fact, a very fierce one. And yet the pose evokes supplication or submission, and for me also allows a sense of grounding. Behold the contradictions of Hindu mythology and of life. It’s not something that’s easy to put down, though it demands patience, so you have to put it down periodically, to let it gel, and to await for some new personal event to allow insight. … reflexology counterpart, Chinese meridian, chakra, and so forth. As with much of yoga, and life: the ways you can examine anything are seemingly endless and so: mind-boggling. You choose which lens to use, for your own practice. For now, one symbolism that is simple and can be meaningful without too much study is that of chin mudra, which has the same symbolism as jnana mudra. 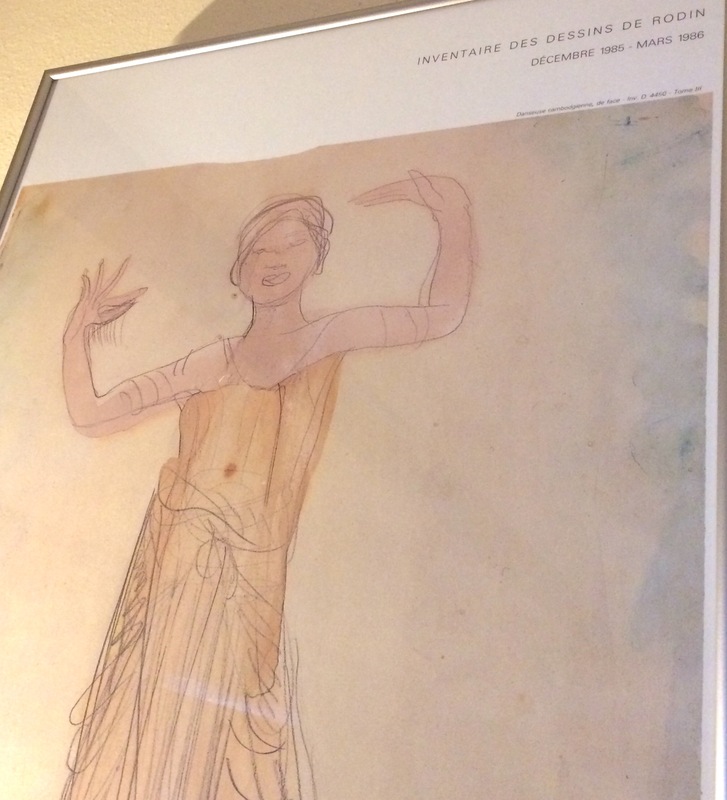 The tip of the index finger is touched to the tip of the thumb (see the dancer’s right hand, in the Apsara dancer drawing by Rodin, above). The palm faces either up (jnana) or down (chin). Consider that the thumb represents the cosmic, or perhaps the divine. Also consider that the index finger represents the individual consciousness. Touching one to the other can represent the desire to connect the two: to gain an awareness of more than one’s own self. In a mudras class I took at Yoga Center of Minneapolis last summer, one of the first things mentioned was that the mudras were powerful and precise. The main concern was around accuracy: we were cautioned to do them exactly right, or something bad or unexpected may happen, though I’m not sure what. The earth’s polarity might change? My menstrual flow may reverse direction? I found it a little worrisome to be in a 2-hour workshop with someone whose primary experience with the mudras appeared to have been reading a few books on them, and perhaps a few years of personal practice with them. It still amounted to more experience than what I had, so I proceeded with caution and only after I too had read the two main books cited in the course. The first book was structured mostly as a DIY-type foray into use of mudras, and it didn’t seem to warn me of anything dangerous. This was Sabrina Mesko’s Healing Mudras: Yoga for Your Hands. I was fairly disappointed that Mesko didn’t use any semi-familiar Sanskrit terms to refer to the mudras, so I sought the other book referenced in the workshop. Gertrud Hirschi’s Mudras: Yoga in Your Hands was a lot more thorough, if not overwhelmingly so. This book is possibly where my local teacher came up with the “mudras are potent so make sure you get the positioning right” warning. And yet it came near the end of the book, well after some damage could have been done — had I been doing anything more than simply trying to follow her sub-optimally helpful instructions and line drawings. Much of the detail about meridians, reflexology and then also herbal applications and mantra suggestions, were covered in Hirschi’s book. I do recommend it, and I keep it on hand. The mudras described in this book often do have Sanskrit names, which is helpful as a reference point, though both books go into a fair amount of detail explaining the application, or reason, to do each mudra. In spite of learning about many different mudras, I simply picked one –Prithivi or Earth Mudra – and started using it in my evening mediation practice. It offered grounding properties that appealed to me – a person who is driven, and often driven in multiple directions. Indeed, picking one to try on is what my mudras teacher had suggested as in initial foray. I felt the best approach was to choose an easy-to-arrange mudra that bore an application that felt useful to me. As mentioned above, I practiced it for a fairly short time before my practice changed a bit, and I found something similar to mudras for a meditation tool. And you know what? That mudra I used didn’t seem to hurt me. Anjali mudra is the one you will practice without fail in a vinyasa class, unless of course you have a reason to dislike holding your hands in a prayer position in front of your chest. The gesture has the same meaning as namaste (i.e., the light and teacher in me acknowledges the light and teacher in everything). An additional symbolism is similar to that of chin and jnana mudra: the hands meeting signifies the connecting of both hemispheres of the brain – thus connecting the divine or cosmic with the self. Anjali mudra also performed as a sign of respect and a greeting in many countries, including one my husband and I visited in 2014: Cambodia. This isn’t the most thorough post on mudras, but I hope it’s helpful or at least interesting to you. My study of them continues! Happy 2017.